This album which you are about to hear will give you more than an earful of the ingredients which are characteristic of a group of three youngsters popularly known by fans in the music world as "THE MAYTALS". When these three youngsters debuted on the scene two years ago, they brought along with them a new style, a new spiritual "SKA BEAT", which was eagerly welcomed by the listening public. When their recordings became "Giant Size Hits", it was obvious that their phrasing and dynamic delivery had earned unreserved approval. 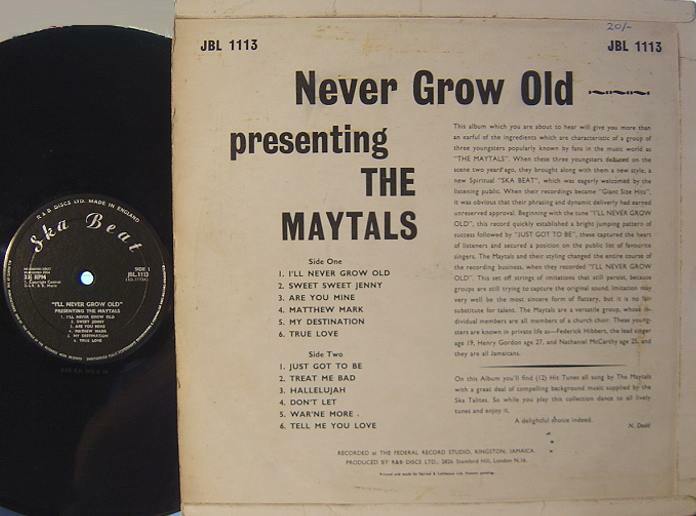 Beginning with the tune "I'LL NEVER GROW OLD", this record quickly established a bright jumping pattern of success followed by "JUST GOT TO BE", these captured the heart of listeners and secured a position on the public list of favourite singers. 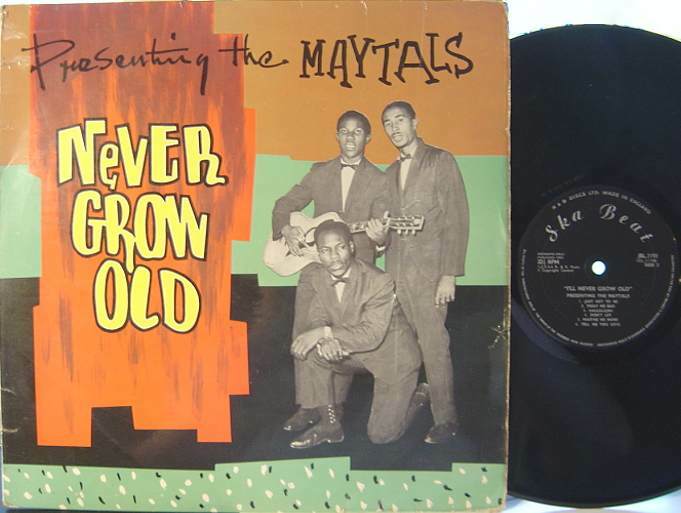 The Maytals and their styling changed the entire course of the recording business, when they recorded "I'LL NEVER GROW OLD". This set off strings of imitations that still persist, because groups are still trying to capture the original sound. Imitation may very well be the most sincere form of flattery, but it is no fair substitute for talent. The Maytals are a versatile group, whose individual members are all members of a church choir. These youngsters are known in private life as - Federick Hibbert, the lead singer age 19, Henry Gordon age 27, and Nathaniel McCarthy age 25, and they are all Jamaicans. On this album you'll find (12) Hit Tunes all sung by The Maytals with a great deal of compelling background music supplied by the Ska Talites. So while you play this collection dance to all lively tunes and enjoy it. Recorded at The Federal Record Studio, Kingston, Jamaica.